Follow Your Heart Pillow Pattern Releases! The Inspiration: My children are most often my inspiration for my creations. These pillows were created for my own little sweet toddler, to match her Follow Your Heart Toddler Blanket. She has been my best model since birth and she is always ready to love (or steal) my creations before anyone else. She and my son are my biggest fans! I knew I wanted something special for her and cluster stitch hearts seemed to hit the nail right on the head. Materials: To create the Follow Your Heart Pillows, you will need an I hook, a tapestry needle for weaving in ends, scissors for cutting the yarn, and a measuring tape to check gauge. 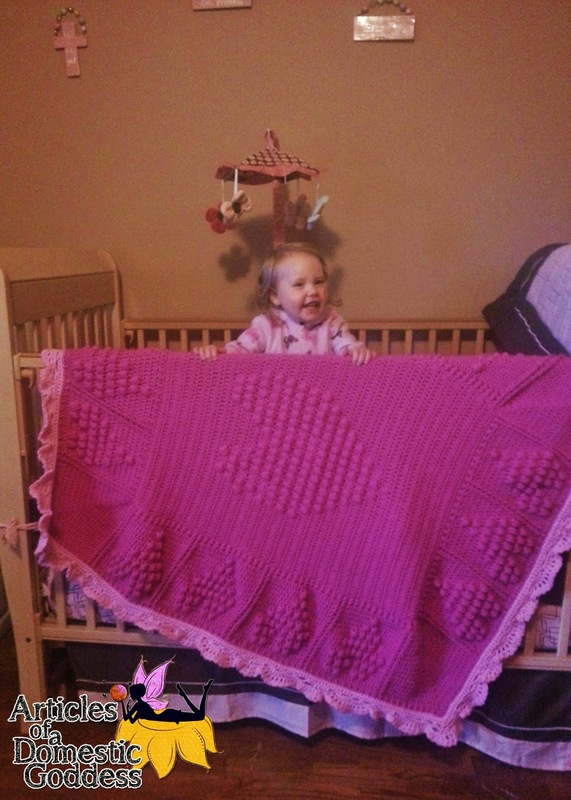 The preferred yarn used in this project is Hobby Lobby’s I Love This Yarn; however any worsted weight yarn will work. 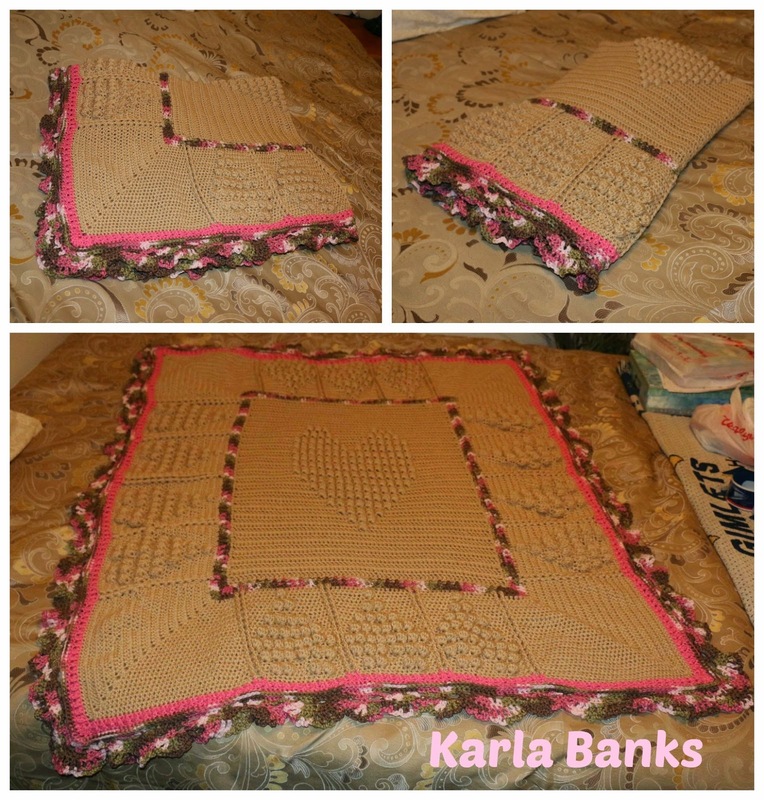 The finished large pillow measures 24 Inches X 21 Inches after the lace edging. The finished small pillow measures 19 Inches X 14 Inches after the lace edging. Embellishments and edge options: The heart square included in these patterns contain a graph/chart so that you can more easily to follow along and so that if you would like to use the squares themselves as pot holders, bath rags (using cotton yarn), or blanket that is created using the squares and sewn together, then you can absolutely do that easily! These patterns utilize a plethora of post stitches including the front and back post double crochet, the elongated front and back post double crochet, the front and back post half double crochet and the front and back post single crochet. 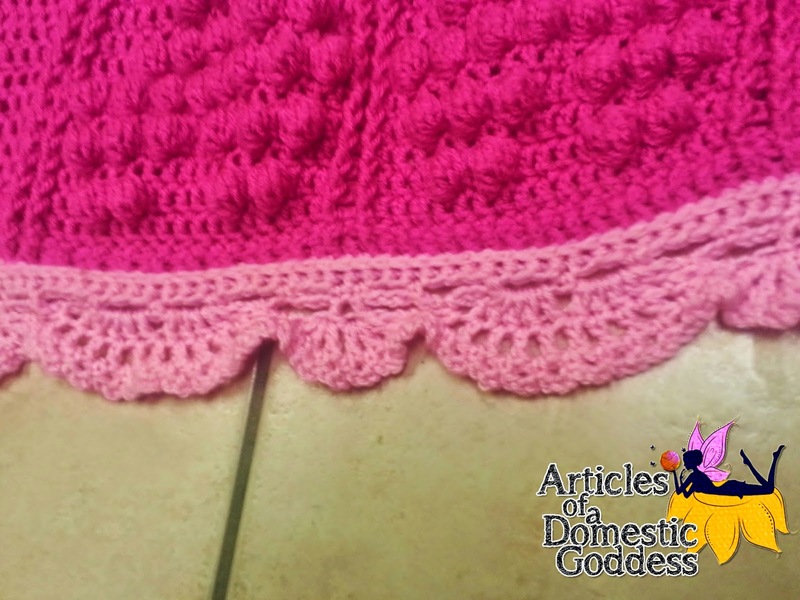 I have included a written walk through on each stitch in the abbreviations section and links to video walkthroughs for each stitch created by myself so they are sure to give you all the information that you need to apply these stitches to these patterns. I also include a written walk through on how to complete the 7dc cluster stitch in the abbreviations section. The lace edging on these pillow patterns give them a very frilly look, but one of my testers has proven that even with the hearts and frilly lace edging, that if the color choices are masculine enough, these pillow patterns will work perfectly for the male toddler or baby! Other Pattern options available for purchase! The Inspiration: My children are most often my inspiration for my creations. These blankets were created for my own little sweet toddler. She has been my best model since birth and she is always ready to love (or steal) my creations before anyone else. She and my son are my biggest fans! I knew I wanted something special for her and cluster stitch hearts seemed to hit the nail right on the head. I also knew that I wanted this blanket to have the LOOK of a granny square blanket, but to be worked in such a way that I didn’t have to finish off and sew pieces together. This blanket pattern includes no sewing and no construction. It is worked in rounds so that (except for where you change skeins) there are only the end and beginning ends to finish off when you’re done! 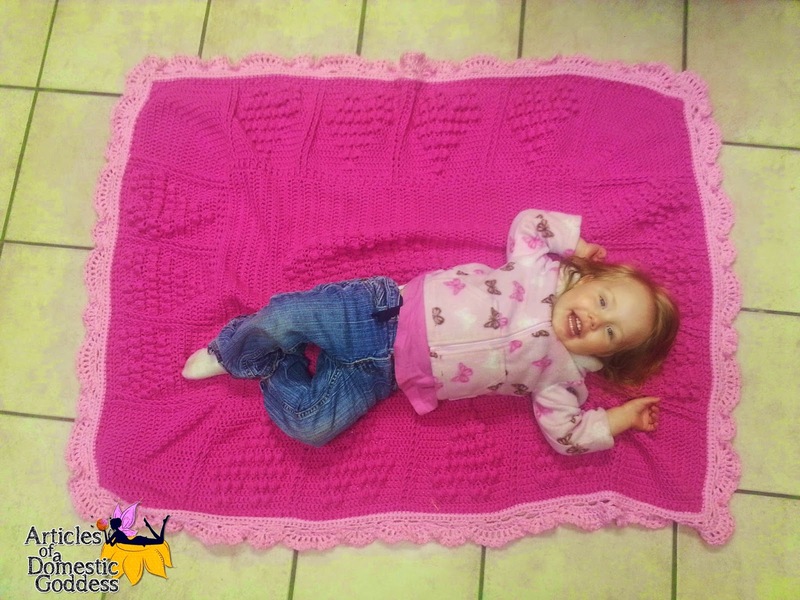 Materials: To create the Follow Your Heart Toddler Blanket/Throw, you will need an I hook, a tapestry needle for weaving in ends, scissors for cutting the yarn, and a measuring tape to check gauge. The preferred yarn used in this project is Hobby Lobby’s I Love This Yarn; however any worsted weight yarn will work. This calls for 4 skeins of I Love This Yarn for the actual blanket and about a ½ a skein for the lace edging. Length and Width Options: When I first created this blanket, I did not use enough increases in the corners, so the finished product came out looking beveled and skewed. I did not like the look of it, however many others DID like this look. I recreated the pattern using more increases in the corners so that the blanket sits square. In my opinion, this is much more attractive. Take a look at my tester photos under the projects tab to see the different options available. I have tested both the beveled and the square cornered blankets, and I have included both blanket patterns in this purchase. 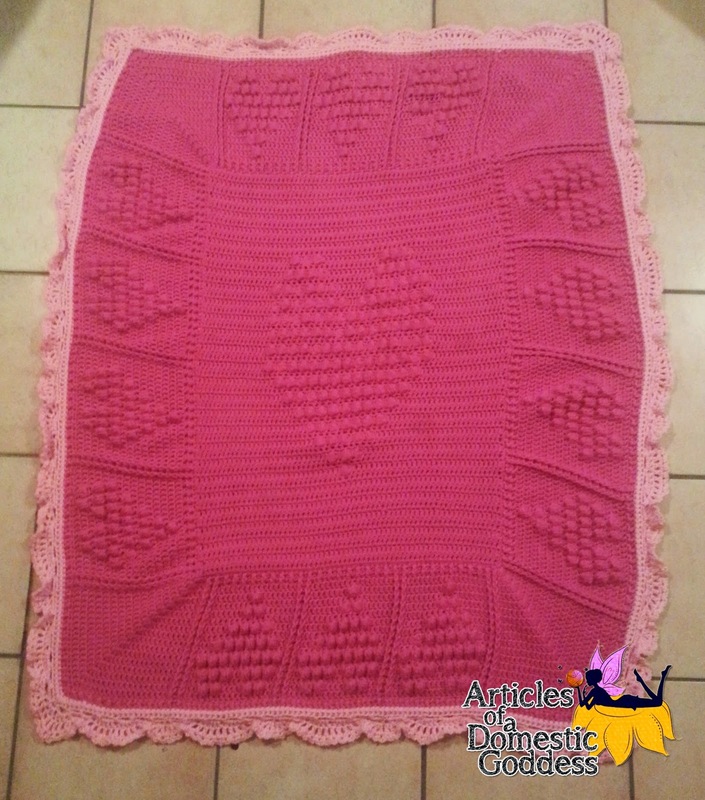 The beveled blanket measures 52X40 inches, while the fixed corner blanket measures 56X44. Embellishments and edge options: Every heart square included in this pattern contains a graph/chart so that you can more easily to follow along. These patterns utilize a plethora of post stitches including the front and back post double crochet, the elongated front and back post double crochet, the front and back post half double crochet and the front and back post single crochet. I have included a written walk through on each stitch in the abbreviations section and links to video walkthroughs for each stitch created by myself so they are sure to give you all the information that you need to apply these stitches to these patterns. I also include a written walk through on how to complete the 7dc cluster stitch in the abbreviations section. The lace edging on these blanket patterns give them a very frilly look, but one of my testers has proved that even with the hearts and frilly lace edging, that if the color choices are masculine enough, these blanket patterns work perfectly for the male toddler or baby! MOST IMPORTANTLY about this pattern sale: You are getting TWO blanket patterns with this purchase! One pattern has more of a beveled look to it at the corners (Pink blanket) and one has fixed, square 90 degree angle corners. (Brown and pink camo) I did this because I goofed on the first one, but I really did like it! And then I fixed it with the other pattern. Enjoy my mistake!